Hangover Helper is your only true friend when you wake up somewhere unknown, with a hangover, after attending a social event involving consumption of alcoholic beverages. 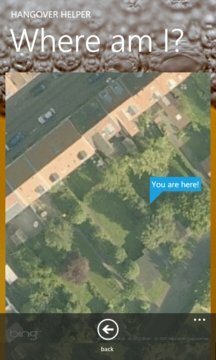 The easy and headache friendly panorama-layout starts out by letting you know exactly where you are by providing a taxi-friendly street address and visual map. You can quickly send your current address to someone if you need to get picked up. Then the application lets you review the photos on your phone in reverse chronological order to give you a rough idea about what happened last night. From the application you can auto-generate messages to your partner/parent. This is a great feature providing quick damage-control before showing up at home. Hopefully the recipient has a sense of humor. 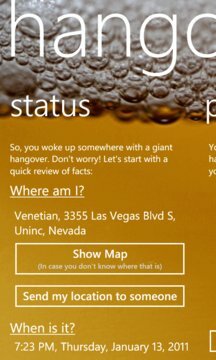 Finally, the application contains a checklist that will help you recover from your current state of hangover faster.